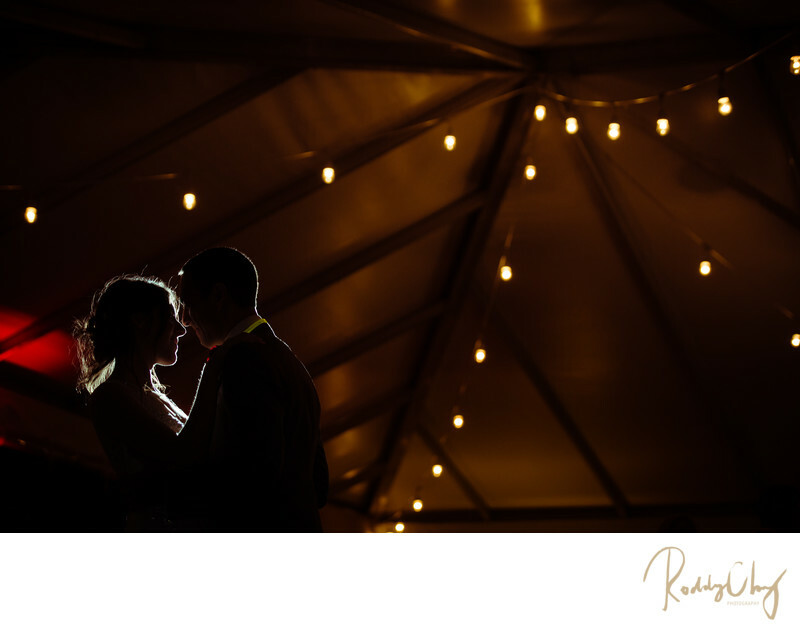 A good wedding photographer needs to be capable of creating beautiful lighting on the spot no matter what the location is. Here we are at Ray's Boathouse reception space. It seems I've taken the couple all the way out from the crowd to take an intimate silhouette photograph. What you don't see is there were a lot of guests right where we were under the tent. I was practically lying on the ground to get the angle from below. And I exposed for the decoration lights on the tent, and I had one flash with MagMod grid to narrow the beam light and light behind my couple. Hence I was able to get this creative portrait. Location: 6049 Seaview Ave NW, Seattle, WA 98107.